Ballots and Booze is the brainchild of a few local Dallas Residents, who want to promote voter education, especially in down ballot (local Dallas & Texas) races. We are a non-partisan group that does not endorse any candidates, but helps voters be better prepared to vote. One of the reasons people don’t vote is because they don’t know the candidates and don’t understand the roles of many elected positions. For example, Do you know what a Comptroller or the Agriculture Commissioner does? Well, you would know, if you had attended a Ballots and Booze event. Our Ballots and Booze team held the first event on Monday, February 19th, 2018 at Halcyon in lower Greenville; a day before Primary Early Voting started. We were anxious about the attendance, but were soon surprised when people started arriving early to our event. At final count, we had over 60 people attend the event. Attendees checked in and were asked whether they know their precinct number. If not, our team looked up their precinct and then provided them a printout of their sample ballot (Democratic or Republican or both). We had stations around the coffee shop where we placed information on each role, example Comptroller, Judge, Senator, Congressman, etc. Our team has been attending many political events and so we know the candidates and could speak about them. We did not invite ANY candidate to speak at our event. However, we invited subject matter experts to attend and help educate the attendees. And as reference, we had our computers handy and visited the Candidates’ sites and looked up candidate information on www.vote411.org to help thoroughly educate the attendees. During and after the event, attendees commented that they were a lot more informed and educated. They felt more at ease to vote in the upcoming primary and would encourage others to attend Ballots and Booze events and vote. Many attendees believed that this event was much needed and loved the idea! Being educated and prepared to vote is more than half the battle and encourages people to VOTE, when they may have originally been intimidated to vote. Given the number of candidates on the ballot during this mid-term election, having this event is key to increasing the voter turnout. The attendees and organizers found the first Ballots and Booze to be useful and educational, and therefore, the Ballots and Booze team has organized Ballots and Booze II for Tuesday, February 27th at Mac’s Southside starting at 5pm. Come join us and share information on candidates you know, get prepared to vote, and help others get prepared to vote in the primary election. Early voting ends Friday, March 2nd and Voting day is March 6th. 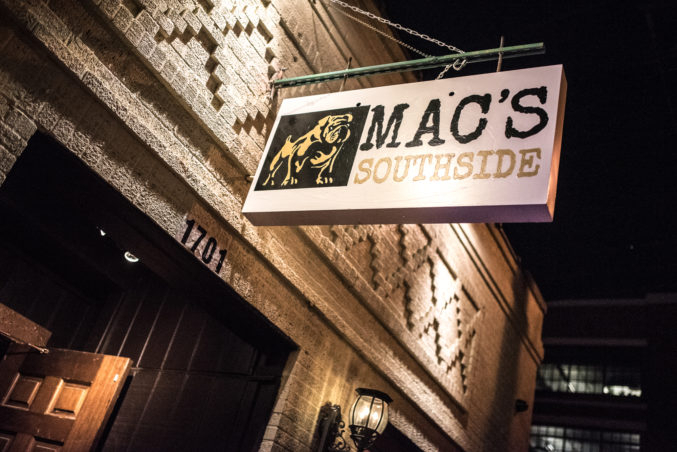 Mac’s Southside, the newest addition to the Cedars, is a neighborhood dive that has it all: plenty of beers on tap, a pool table, comfy couches around a big screen, piping hot pizza, and even a resident bulldog.